"For over 30 years millions of aliens are slaughtered daily in video games. Until now they could not strike back. Until now they could not attack us in the real world..."
Note: The iPhone version needs compass, which means you need iPhone 3GS to play it. 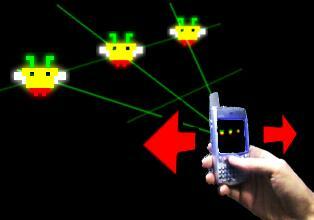 This is because the camera cannot be used for detecting motion, like in the Palm version. No more killing feeble aliens on the tiny 2" x 2" screen! In this game you must handle hostile creatures floating around you in the real world. How is this possible? 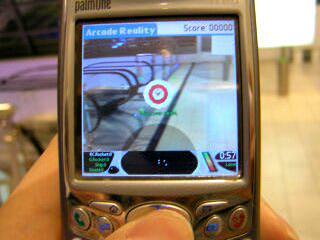 Imagine you have a device, like night vision goggles, that can detect out-of-this-world objects... and when playing Arcade Reality, your Treo is such device. Game objects are overlaid on the live camera view (this technology is called Augmented Reality). When you turn around, your motion is calculated based on what is seen by the camera and the game view gets updated accordingly. As you can see, motion is the key. Unlike most games where you only train your fingers, you must actually move to play Arcade Reality! Arcade Reality - the main mode, featuring the FPP shooting scored for precision, interleaved with the special "bonus levels"